To paraphrase one of the great critiques of reviewing, writing about a visual medium is like dancing about architecture—a challenge, to put it mildly. But like Wile E. Coyote’s relentless pursuit of the Roadrunner, J. P. Telotte enthusiastically attempts the impossible—discussing the importance of “space” in animation, from the physical to the philosophical, without the use of the visual platform on which animation rests—in his latest study on the culture of film, Animating Space: From Mickey to Wall-E.
Telotte frames his discussion within the history of animation, weaving these philosophies in as he goes. Moving through time, the study starts at keyframe animation’s beginnings with Winsor McCay’s 1914Gertie the Dinosaur and ends at such recent live-action-and-animation hybrids as 2004’s Sky Captain and the World of Tomorrow and 2007’s Beowulf. This approach shows how time and technology have slowly led animation from Gertie’s Point A, where the animator brings himself, and his audience, in to the film, and the animated actors manipulate their own worlds from inside the screen, straight to today’s Point B, where humans in film are often motion-captured simulacra, carrying out their actions in animated worlds through special effects. Animating Space traces technological innovation in animation through time as well, and studies how its use became animation’s double-edged sword: through technology, animation could make its audiences feel that the action on screen was almost as real as reality itself. Telotte then asks the question: if animation ceases to be fantastic, then how is its reality any different than the reality of live-action film? If animation strives to become more real, then what is the need for the expense and time called for by animation? Here, Telotte succeeds in studying and explaining the mitigation of this potential disaster by examining the path of Disney Animation, and exploring how that studio used technology to their advantage by not simply allowing technology to give their films nice decoration, but rather by using it as part of the film’s natural environment, by having characters interact with the advances technology afforded them and making technology almost a part of the story—making it seem as though the characters all lived in three-dimensional worlds. This move not only served to help audiences accept the characters, but also helped the films retain their sense of the fantastic, the feeling modern audiences continue to have when confronted by wonders of modern cinematic technology: the awestruck wonder accompanied by a gasp of “how did they do that?” This jump also helped to re-define animation’s status, moving it from a sub-category of film to being thought of as film in its own right. Moving on from his study of full animation, Telotte discusses hybrid films, such as 1988’s Who Framed Roger Rabbit, where animated characters and humans interact with each other within the same worlds. In these works, Telotte begins to move out of Vidler and Kern’s relativistic vision and into the “reality effect” world of Virilio, slowly building toward a caution “about the reality effect that has become pervasive in postmodern culture . . . to both animated film and life itself.” Telotte goes on to quote Patrick Tatopolous, a production designer and director, as saying “the dangerous thing about creating environments in CG is that because you can do anything, you can lose track of that sense of reality,” which can, in turn, Telotte says, “create impossible spaces, improbable movements . . . and pointless trackings through ‘space.’” Telotte closes by looking at today’s modern films, pointing out how virtually everything released now combines live-action and animation, binding animation inseparably from film in ways its pioneers could never have imagined. 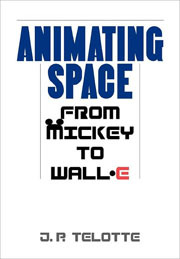 While Animating Space proves surprisingly adept at attempting to show readers what the author has seen in a lifetime of studying the history of animation, the truth is that if the reader does not already have an understanding of animation, its jargon, or its history, this book may prove frustrating or even inaccessible without a dictionary and YouTube close at hand. 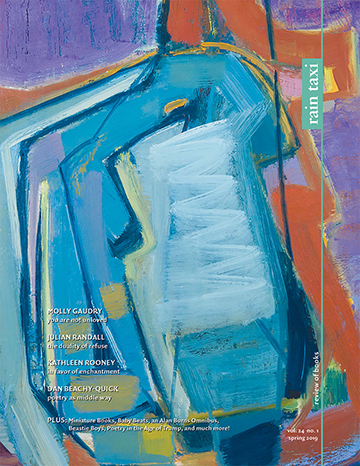 If the reader cannot instantly conjure up an image of the film being analyzed, much of the discussion falls flat and otherwise convincing points can easily be lost. Thus, the book needs more images than it provides to woo those outside the “animation geek” realm. This aside, Animating Space succeeds marvelously, and provides a means for exploring how animation has reflected society’s views on what is and is not permitted when it comes to films showing us versions of our own realities. Whether there is any intentionality on the part of the animators behind this reflection remains unproven, however Telotte’s point was not to prove causality, but simply to study how animation’s rules have changed as society’s perception of reality has shifted. As a study, the book manages to do just that. With a little more architecture and a little less dance, it does what the coyote couldn’t—it catches the elusive Roadrunner.